Games are a significant player within the entertainment sector, accounting for a large portion of the global entertainment economy. 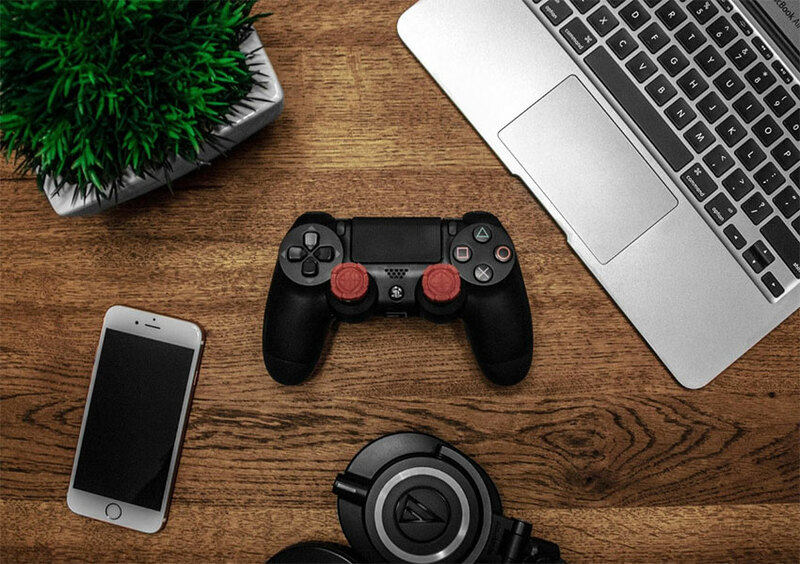 Over the last decade, mobile and web gaming has come of age while the increasingly powerful hardware found in games consoles and gaming PCs can accommodate increasingly rich, fully featured immersive gaming. In this article, we consider the people behind the games - the developers. The insights reported below are based on the Developer Economics Survey by Slash Data, which took the opinions of those working in games development, either as professional developers, hobbyists or students. If you’re a games developer, you may be interested to know a bit more about people like you working in the industry. So, read on! 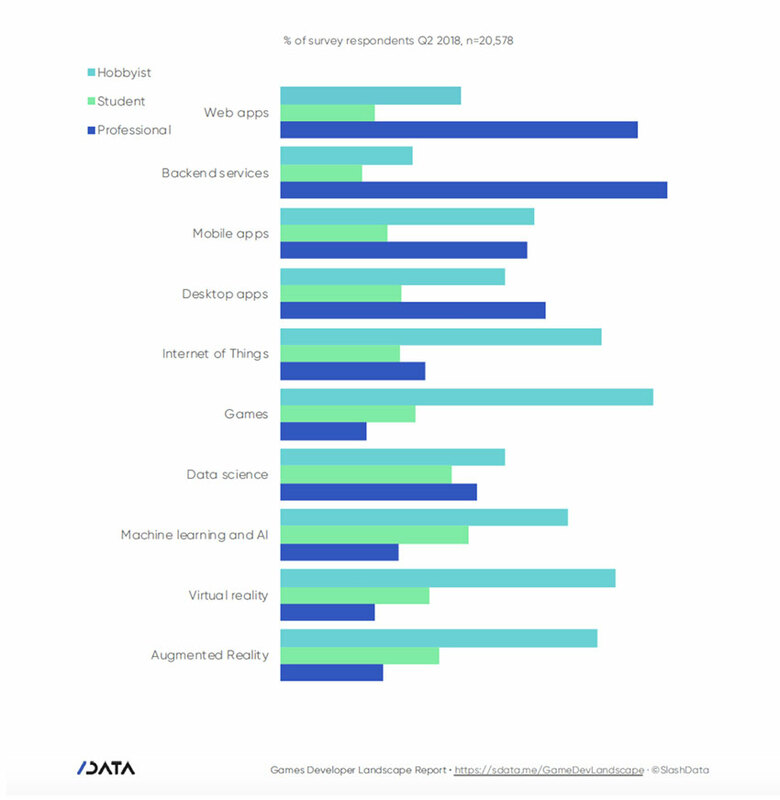 Here at SlashData, we run regular surveys of software developers around the world to uncover valuable insights from those working in mobile, desktop, IoT, cloud, web, game, AR/VR, data science and machine learning. The 15th Developer Economics global survey wave ran from May to June 2018 and reached more than 20,500 developers from 167 countries. We are currently running another survey and we would value your input. If you’re a games developer and would like to share your thoughts with us, why not take our survey? Even if you’re not working in games, we’d still like to hear from you and do feel free to pass the link on to your developer friends and colleagues. Every survey completed has a chance to win Oculus Rift +Touch Virtual Reality System (or simply play around), Samsung S9 PLus, $200 towards the software subscription of your choice, or other prizes from the prize pool worth $12,000. Hint: look for the special prizes for games developers inside the survey, like headphones of your choice up to $80 or Dixit board game. Plus, if you refer other developers to take the survey, you may win up to $1,000 in cash. Just don’t forget to sign up before you take the survey so that we know you want to be included in the prize draw. On to the juicy stuff...how many people are working in games development? Across the population of developers answering our survey in Q2 2018, 39% said they were involved in games development, but only 6% reported to be working as professional games developers, while 10% identified themselves as students of games development, and 27% were writing games as a hobby. Taking into account our estimate of the number of software developers globally in Q2 2018, we estimate a population of 7.7M games developers worldwide. But games have been a part of the software landscape for decades, haven’t they? So why are games developers still a small cohort? In part the sector has expanded relatively recently; mobile and Internet-based gaming only really took off in the last decade. Games development is also highly segmented. There are many developers who work on aspects used within games development, such as frameworks and graphics pipelines, while not creating games themselves. As such, they may not directly identify themselves as games developers. Of the development areas we surveyed, such as games, web or mobile, games have the smallest percentage of developers who identify as professionals. This may well lend weight to the suggestion that the industry is segmented and many professional developers are not directly involved in creating games, but instead in enabling games creation. From our survey, the largest population of hobby developers by proportion was found in the games vertical, accounting for almost three-quarters of it. This may well be because creating games is an accessible hobby for all kinds of programmers. Games can span a huge range of platforms and styles, and writing games as a hobby are fun. It can also be a way to try out different technologies without being too much like a day job. In North America, eight out of ten games developers identify as hobbyists, with a similar number in Western Europe. This may perhaps be a result of these regions being the first to establish games development as part of the mainstream. Hobby development has also had a long time to establish itself, starting in the 1980s with home setups such as the ZX Spectrum, BBC Micro and Commodore 64. The developer population in these locales has had time to get comfortable with hobbyist games development. Indeed, North America has long been a well-established powerhouse of games development and, in Q2 2018, this region accounted for the largest population of the world’s games developers. The next largest population was found in East Asia, which is unsurprising as China is the world’s largest market for purchasing and playing games. 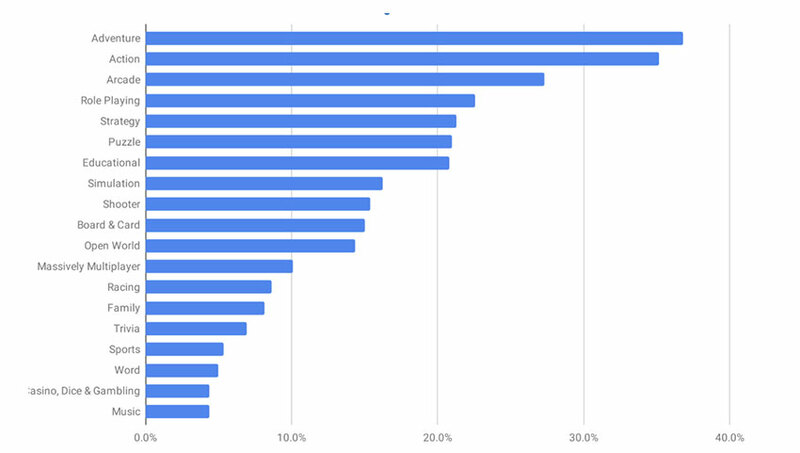 The third largest region in terms of games developers in Western Europe and Israel. Most games developers have less than 3 years’ experience. Almost one third have less than 1 year of experience. A similar pattern can be observed for mobile, IoT, data science and machine learning developers, reflecting their relatively recent arrival and growth in the software field. The nascent fields of AR and VR have even fewer experienced developers, as we would expect from their relative infancy. There is also skew towards youth in the games developer community compared to the population of all developers answering the survey. In recognition of the contribution of games to the economy, a number of governments have recently created education schemes to offer funding for those training to be games developers. The relative youth of the games developer population may reflect the successful uptake of these initiatives as they encourage young people to study games development and enter the industry. The proportion of games developers over 35 is smaller than the general developer population. Older developers rarely make a transition into games from other development fields for various reasons, including the comparatively poor compensation rates and long working hours typical of the games industry. We would not, therefore, expect a large group of older developers in an industry that, as we have already observed, has newly arrived. We asked those identifying as games developers in the survey “What is the most important goal in games development for you?” Making money seems to be a low priority for the combined group of all games developers, with just over one in ten saying that their most important goal is to generate direct revenue. Given that such a high proportion of games developers responding to the survey identify as hobbyists it is perhaps not surprising that the focus is not on making money. The “non-monetary” goals (having fun to build things, gaining experience, being creative) all rank higher than those goals that directly or indirectly generate revenue, and combine to account for the goals of almost two-thirds of the game's developers responding to the survey. Hobbyist developers place having fun at the top of their list of reasons for creating games. In comparison, professional games developers don’t seem to prioritize having fun creating games. This is somewhat to be expected, given that they are talking about their day job, rather than what they do in their spare time. Interestingly though, the number of professional games developers wanting to create or express themselves in an artistic way matches that of the broader games developer population. Professionals may not set out to have fun, but they do aim to be creative. The games development community is still small, but this can be explained by a relatively recent expansion due to mobile and Internet gaming, and segmentation into product creators and those that enable them. The majority of those identifying as games developers are hobbyists and they are relatively inexperienced and youthful. Our survey found a community of games developers worldwide, but with a strong concentration in North America, Western Europe, and East Asia. We also discovered that games developers were more interested in having fun than making money and that creativity was valued by all types of developer equally. If you have any thoughts about our findings, please leave them as comments to this article. And if you’re a developer, don’t forget to complete our survey to give us your input! SlashData assists top 100 technology companies in making profiles of communities of developers in order to measure the potential return of investment of their developer strategies. As a company of analysts, they annually survey over 40K developers worldwide and analyze the gathered data to help clients find the right development partners.